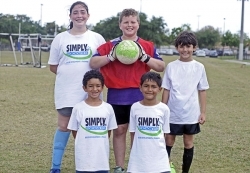 The Simply Soccer Summer camp dates in Coral Springs have been announced and registration is now open for the 28th year of the camp in the city of Coral Springs. The soccer camp is for boys and girls, ages 5-15, and of all skill levels, who will be taught a variety of soccer skills from dribbling to shooting. There are three sessions each day ranging from 9 a.m.-3 p.m.(the cost is $150 weekly); extended hours camp is available from 8 a.m.-4 p.m. for $165 each week, and a Tiny Tot program is offered for kids ages 5 and 6 from 9 a.m.-noon for $80 weekly. We also offer a second child discount. The Summer dates are June 13-17; June 20-24; June 27-July 1; July 11-15; July 18-22; July 25-29; August 1-5; August 8-12; August 15-19. Campers must bring a soccer ball, swim suit, shin guards, water bottle and lunch. You do not have to be a city resident to attend. For more information, call the city of Coral Springs Parks and Recreation Department at 954-345-2200 or call Gary Curreri, Camp Director at 954-755-6778.